So the super-heroes, about to face more of the alien monsters, are saved by a cadre of classic Marvel monsters, including Fing Fang Foom, and Googam, son of Goom. The classic monsters, it is revealed, were "summoned" by Kei Kawade, a young boy who is a NuHuman with the power to call forth the monsters he draws. 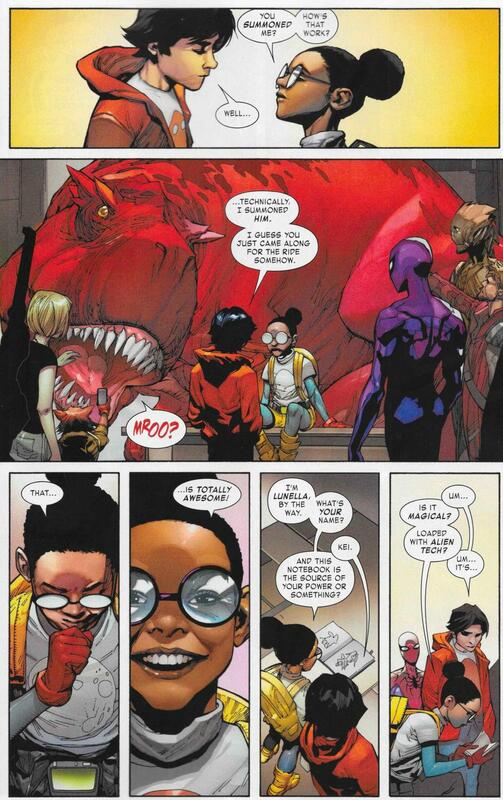 He proves it to the heroes by summoning Devil Dinosaur. This brings Moon Girl along for the ride. There's also a bit about how he's a destined Inhuman hero, the last version of which lost their life failing to stop the creature behind the new monsters, the Leviathan Queen. Who is now on Earth. I was actually thinking about posting stuff from this! I'm honestly kind of shocked Marvel still remembers Groot's Planet X origins. It did appear in the last issue of Groot's solo series, but before that, the last time it got mentioned was during the Rocket and Groot back-up in the Annihilators' mini, where it was revealed Groot wasn't a king after all. Glad to see I'm not the only one really enjoying this. Like I said above, I honestly can't think of a time I've enjoyed a crossover more. It puts me in mind of the kinds of crossovers Marvel did in their annuals, like Atlantis Attacks or Evolutionary Wars. Fun, but ultimately inconsequential in the scheme of things. I was waiting for someone to post stuff from this already. This events is so good. The one-shot tie-ins are just as good. Avengers: Monsters Unleashed! and then Spider-Man & Deadpool: Monsters Unleashed! Loved it! Doctor Strange: Monsters Unleashed! co-starring Goom! Loved it! I thought the X-Men tie in was rather weak and passed on the Spider-Man/Deadpool one, but really loved the Avengers one and the Doctor Strange one. The Inhumans' one was a pretty good use of Sway, so that was good as well. I can really recommend the Spider-Man/Deadpool. As I was writing it I didn't mention the X-Men one because it wasn't memorable. I really don't remember what happened in that book so meh. Ahh, yes. The Swain book. It ends with repercussions for Swain although I wonder in what title those will be felt for her. I'll have to snag it on my next comic run then. Possibly the upcoming Royals book, since she's going into space with them. Event fatigue has maybe made people reluctant to pick it up. And Inhumans vs. X-Men seems to be getting a bigger push? I admit, I mostly got the first issue because my shop pulled me a copy. 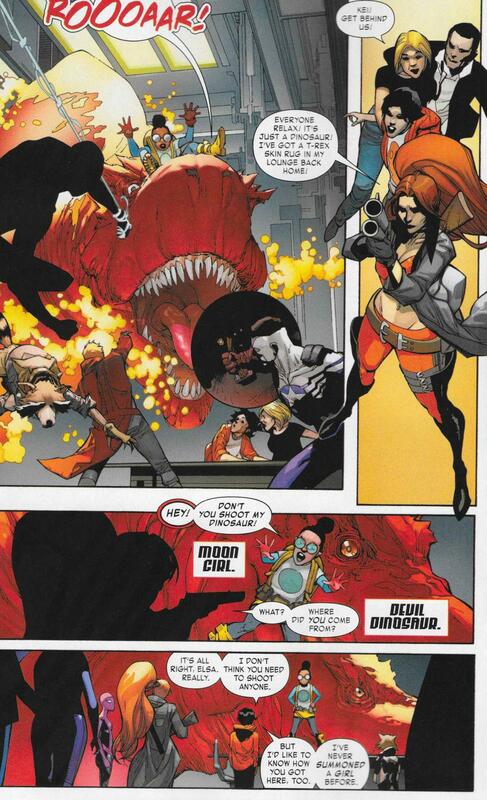 But I generally like Cullen Bunn's work, and I love the old Marvel monsters, so I'm quite glad I did. But it seems poorly timed, sliding between and under the radar of two more heavily pushed hero vs. hero events. Well, I guess we have to bear in mind that Civil War II was supposed to have ended a couple months earlier than it did so I can't blame the writers, artists and editors of this project. I think the idea was that while you had IvX going on this is what the rest of the MU was concerned with. Instead now it feels like readers getting repeatedly pummeled with events. Which is still true, but would have felt less so had Marvel managed to keep their CW II staff in line. That makes sense. Instead of being a light-hearted romp in between two heavy events, now it's happening as they're going into Secret Empire. It's a fun book, but I think it'd be more kindly received if not for Civil War II and its associated delays. Yeah, I doubt that helped. That everybody went from "at each other's throats" to "let's team up and fight monsters" is also a bit jarring. Marvel seems to have ignored it entirely in favour of the latest heroes vs heroes nonsense. Which is a shame, because it's brilliant. Heroes, monsters, heroes punching monsters! Wait, whoa, hold on... heroes... punching... monsters? Not other heroes? That don't sound right. That don't sound right at all. Yeah, I'm reasonably certain it's illegal to write a crossover that doesn't involve heroes fighting heroes. Look for these issues to be confiscated soon. Ah, like in the Dark Times, when a person couldn't mention Stephanie Brown or Cassandra Cain without being dragged off by goons. It's such a pure concept. That heroes fighting an actual evil, external threat that none of them are responsible for unleashing or creating*, is seen as refreshing is actually kind of depressing. *There's enough of an Inhuman connection to maybe blame Black Bolt for drawing the threat to Earth, but that's debatable. It's a pretty constantly proven fact is that for all the complaining people don't want 'fun' events, they want something controversial that they can argue over. Even DC's rebirth is more hyped because it has the Watchman connections, and 'real' superman replacing the nu52 one. I can see that interpretation, yeah. Complaining does have its fun parts (even I'll cop to that). But it is nice to see something fun being published, regardless. Debatable. I'd say there's more hype behind Rebirth mostly being a return to form - Green Arrow, Wonder Woman, and so on. There's a lot of good stuff there. As for Watchmen? I don't think that's hype, more mostly 'oh god why'. She's also going to be in the ongoing that spins out of this. Oh, even better. I love her. I'm more partial to her original miniseries version than her Nextwave inspired version, but she's always a bonus. Heh, all I've read with her in has been A-Force and Nextwave, but she's great. 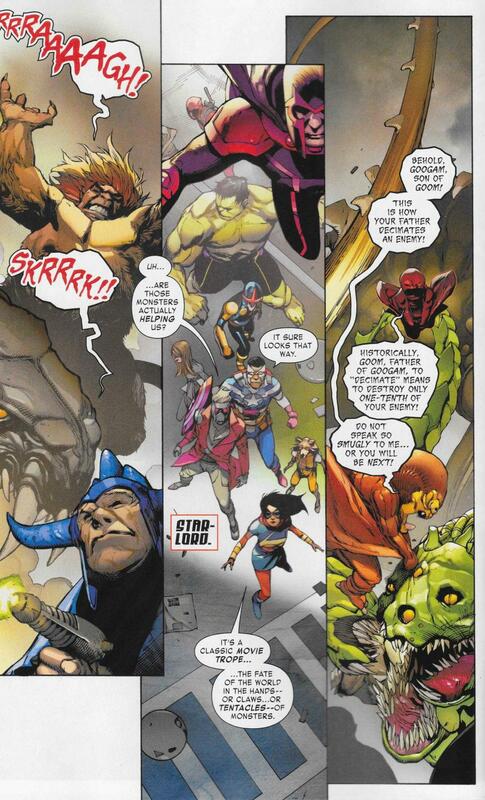 (And Nextwave is....such its own thing, really.) This definitely looks worth picking up in trade at least. I really need to read Nextwave one of these days.